Elgin, Illinois – January 21, 2019 – Anyone with a canine companion that has experienced Brachycephalic Obstructive Airway Syndrome (BOAS) knows the limitations it can place on the dog. The new patent-pending Health Harness developed by the Frenchiestore is the first harness designed to let dogs with BOAS go for walks without interfering with their breathing. From bulldogs and boxers to Pekingese and spaniels, dogs with BOAS experience breathing difficulties due to a shortened muzzle that constricts their airways. Symptoms range from mild to severe and have a significant impact on a dog’s mental wellbeing and physical health. Breeds with BOAS often struggle to breathe even during mild exercise. The inability to breathe in a sufficient amount of air to pant and cool themselves makes them especially susceptible to overheating and collapse, even in mildly warm weather. The feeling of choking can be terrifying for the dog and may result in anxious behavior. The Health Harness is designed with dual D rings and double breakaway brass buckles to provide a safe, no-choke, no-pull walk. Created for dogs with BOAS, the Health Harness has a myriad of other uses. The front D ring makes it ideal for training dogs that like to pull, along with those that have aggression and dominance issues. It is equally effective for canines with arthritis, mobility problems, and dogs receiving water therapy. Additionally it is beneficial for dogs with intervertebral disk disease (IVDD), those with a prior neck, back or spine injury, and blind or vision deficit canines that need guidance. 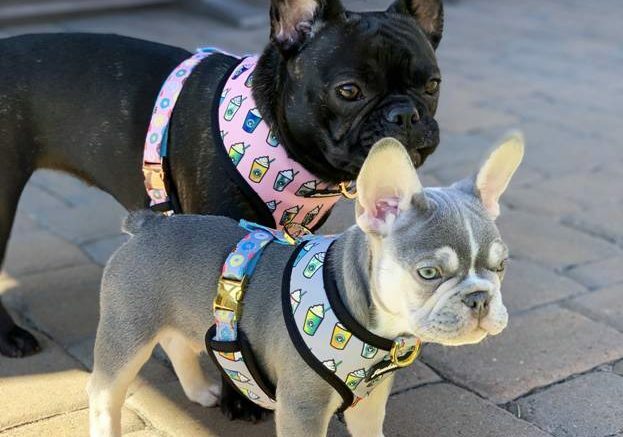 The Frenchiestore also offers a variety of products designed for pet safety and style, with an emphasis on organic materials. Dog parents will find colorful cooling bandanas and chic bowties for the well-dressed canine. Stylish collars and leashes, hypoallergenic hoodies to keep dogs warm, soft pajamas and plush blankets for lounging are all available in multiple colors and patterns. The patent-pending Health Harness offers individuals that own a canine prone to BOAS with an innovative solution for the health and safety of their dog. The boutique dog shop offers a wealth of organic clothing and accessories for fashionable dogs around the world. The designs and visions at Frenchiestore are inspired by the founders’ own French Bulldog, Bluenjy. The company has been featured in a variety of print and broadcast media and works to increase awareness of breeds prone to BOAS and their unique needs. Moreover, the company participates in a variety of fundraisers and charitable projects. The Frenchiestore is more than just a brand, it is a movement. Be the first to comment on "Frenchiestore Debuts Innovative Health Harness for Dogs with BOAS"